In 1972 NSA established a program known as National Neighborhood Watch, aimed at uniting law enforcement agencies with citizens to work together to prevent crime. The Neighborhood Watch Program involves the organization by citizens of community/neighborhood groups which contact law enforcement agencies and work with them to establish crime prevention measures and procedures to reduce criminal opportunity and to report suspicious and criminal activity to law enforcement. Under its Neighborhood Watch Marks, NSA facilitates and promotes the Neighborhood Watch Program and public education and awareness of the need for crime and terrorism prevention, public safety and homeland security by use of Neighborhood Watch programs, and provides information, publications and materials regarding the establishment of Neighborhood Watch programs and crime prevention tips and practices, together with related merchandise, such as decals, stickers and signs. 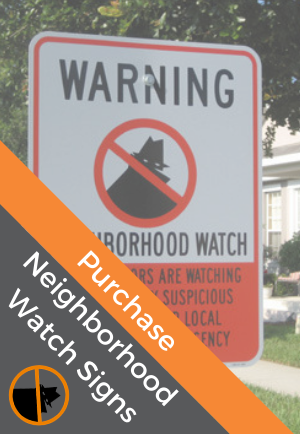 NSA’s Neighborhood Watch Marks are nationally recognized by the general public and are strongly associated with NSA. Preventing burglaries and other neighborhood crimes through citizen involvement and partnerships with law enforcement is the goal of the Neighborhood Watch Program. NSA’s Boris the Burglar Logo and its Boris the Burglar and Boris word marks represent the threat of burglaries, vandalism, and other neighborhood crimes. This threat is one of the motivating factors for the formation of Neighborhood Watch groups. The international prohibition symbol in NSA’s Boris the Burglar Logo denotes saying NO to the threat of burglaries, vandalism, and other neighborhood crimes embodied in the design of the burglar within such mark, which burglar is referred to, and through NSA’s extensive and continuous use has become known as, Boris the Burglar and/or Boris. Saying NO to Boris the Burglar projects a clear, positive, and constructive message, and represents a commitment to crime prevention. The message of saying NO to Boris the Burglar encourages people to help themselves and others in their neighborhoods by engaging in target hardening and other crime prevention measures. Saying NO to Boris the Burglar portrays a neighborhood's willingness to foster positive relationships with law enforcement, community leaders, and others through the formation of Neighborhood Watch groups. If, after considering your application, NSA approves in writing your requested use of any of NSA’s Neighborhood Watch Marks, then you may use the approved mark(s) in accordance with the license terms and conditions set forth in paragraph D below. Please note that no usage rights arise merely out of the filing of an application for permission to use the marks and none of NSA’s Neighborhood Watch Marks may be used without (i) the prior written approval of NSA and (ii) a license agreement with NSA. None of NSA’s Neighborhood Watch Marks may be used for commercial, for-profit uses, including but not limited to the manufacture, production, promotion and sale of products or articles bearing NSA’s Neighborhood Watch Marks, except pursuant to an executed License Agreement with NSA; such license agreement must be a separate written commercial license agreement signed by an authorized representative of NSA and the licensee, and not the license agreement set forth in paragraph D below, which is not applicable to commercial, for-profit uses. If you are interested in obtaining a commercial license to use any of NSA’s Neighborhood Watch Marks for commercial, for-profit purposes, please contact NSA’s Executive Office, which will consider such request and provide the terms of any commercial license, if NSA is amenable to granting such a license. D. License of NSA’s Neighborhood Watch Marks for NSA-Approved Educational or Non-Commercial, Not-For-Profit Uses. 1. The Neighborhood Watch Marks are the sole and exclusive property of NSA. The Neighborhood Watch Marks may be used pursuant to the terms and conditions of this limited, non-exclusive, non-transferable and revocable license. Any failure by a user to comply with the terms and conditions contained herein may result in the immediate revocation of this license, in addition to any other sanctions or remedies sought by NSA. The interpretation and enforcement (or lack thereof) of these terms and conditions and compliance therewith, shall be made by NSA in its sole discretion. 2. In connection with any approved use of any of the Neighborhood Watch Marks, NSA shall make available to the user an electronic image file of such mark. Except with NSA’s prior written permission, such mark(s) may not be revised or altered in any way, and must be displayed in the same form as provided by NSA. Users must also present each Neighborhood Watch Mark with any legends or symbols prescribed by NSA from time to time, such as registration symbols. Linking to NSA’s website, through its marks or otherwise, may only be done with the prior written permission of NSA, and only to NSA’s home page. Any such permission shall be subject to revocation at any time in the sole discretion of NSA. 3. NSA’s Neighborhood Watch Marks may only be used as indicated in NSA’s written approval of the permitted use (including the nature and scope of the use, the media or articles with which the mark may be used, the duration of the use, the territory of use and any other restrictions). The duration of the license granted herein shall be the shorter of any duration specified by NSA in its approval of the permitted use, NSA’s revocation of the license [or one (1) year from the date of NSA’s written approval of the permitted use]. Notwithstanding the foregoing, NSA’s Neighborhood Watch Marks may not be used in any manner that, in the sole discretion of NSA: discredits, harms, diminishes or tarnishes NSA, its services, products, marks, reputation or goodwill; is false or misleading; violates the rights of others; violates any law, regulation or other public policy; or mischaracterizes the relationship between NSA and the user, including but not limited to any use of the Neighborhood Watch Marks that is likely to cause consumer confusion or that might be reasonably construed as an endorsement, approval, sponsorship, or certification by NSA of the user, the user’s business or organization, or the user’s products or services. 4. Use of the Neighborhood Watch Marks shall create no rights for users in or to the Neighborhood Watch Marks or their use beyond the terms and conditions of this limited and revocable license. The Neighborhood Watch Marks shall remain at all times the sole and exclusive intellectual property of NSA. NSA shall have the right, from time to time, to request samples of use of the Neighborhood Watch Marks and the articles to which such marks are attached, from which it may determine compliance with these terms and conditions. Without further notice, NSA reserves the right to prohibit use of the Neighborhood Watch Marks if it determines, in its sole discretion, that a user’s mark usage, whether willful or negligent, is not in strict accordance with the terms and conditions of this license or otherwise could discredit, harm, diminish or tarnish the Neighborhood Watch Marks or NSA’s reputation and goodwill. NSA reserves the right to disallow any use of the Neighborhood Watch Marks. 5. THE NEIGHBORHOOD WATCH MARKS ARE LICENSED “AS IS” WITHOUT WARRANTY OF ANY KIND AND NSA DISCLAIMS ALL WARRANTIES, EXPRESS OR IMPLIED, WITH RESPECT TO THE NEIGHBORHOOD WATCH MARKS, INCLUDING BUT NOT LIMITED TO ANY IMPLIED WARRANTIES OF MERCHANTABILITY, FITNESS FOR A PARTICULAR PURPOSE, TITLE AND NON-INFRINGEMENT. IN NO EVENT SHALL NSA, ITS AFFILIATES AND THEIR RESPECTIVE DIRECTORS, OFFICERS, EMPLOYEES AND AGENTS (COLLECTIVELY, THE “NSA PARTIES”) BE LIABLE FOR ANY DAMAGES OF ANY KIND ARISING FROM YOUR USE OF THE NEIGHBORHOOD WATCH MARKS, EVEN IF NSA HAS BEEN ADVISED OF THE POSSIBILITY OF SUCH DAMAGES. YOU AGREE TO INDEMNIFY, DEFEND AND HOLD HARMLESS THE NSA PARTIES FROM AND AGAINST ANY AND ALL CLAIMS, LIABILITIES, DEMANDS, CAUSES OF ACTION, DAMAGES, JUDGEMENTS, SETTLEMENT AND EXPENSES (INCLUDING REASONABLE ATTORNEYS’ FEES) SUFFERED OR INCURRED BY ANY OF THEM BASED UPON OR ARISING OUT OF YOUR USE OF ANY OF THE NEIGHBORHOOD WATCH MARKS. 6. Any questions concerning use of the Neighborhood Watch Marks or the terms and conditions of this license should be directed to Copyright Agent at nw@sheriffs.org.